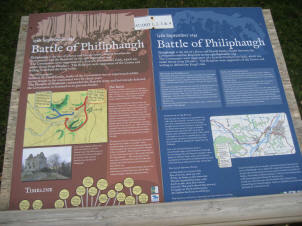 Philiphaugh is the site of a fierce and bloody battle, fought between the Covenanters and the Royalists on the 13th September 1645. 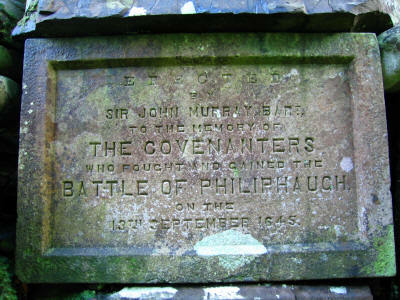 The Covenanters were supporters of a Scottish Presbyterian faith, which was under threat from Charles 1. The Royalists were supporters of the Crown and willing to defend the King’s rule. General Sir David Leslie, leader of the Covenanters was an experienced soldier having fought in the continental wars for thirty years. The Marquis of Montrose commanded the Royalist Army and had already defeated the Covenanters in Scotland in six previous battles. Montrose marched to Selkirk on 12th September 1645 hoping to recruit more soldiers to the Royalist cause. He spent the night along with most of his officers in Selkirk town leaving the rest of his troops camped in the fields at Philiphaugh. General Leslie having been informed about the location of Montrose’s army made a surprise attack during the early morning mist of 13th September. The Royalists repulsed this initial assault. The noise from the encounter alerted Montrose who galloped to the battlefield. He mustered his troops against a second wave of attack but meanwhile 2000 horsemen from General Leslie’s Cavalry had skirted around Howden Hill and began attacking the Royalist army from the rear. Back at the front, General Leslie placed himself at the head of his battalions and attacked the Royalist foot soldiers, driving them towards the high ground at Calton Cottage. The Royalist army was in disarray; the cavalry fled leaving the foot soldiers surrounded. Some managed to fight their way out leaving behind the Irish contingent who were promised their freedom if they surrendered. The Covenanters went back on their word and put them to the sword along with the camp followers. The remaining prisoners were taken to Newark Castle and were shot and buried in the field, which has become known as Slain Men’s Lea. Montrose was persuaded by his men to leave as the battle was lost and he fled across the Minch Moor towards Traquair with his remaining cavalry. The Marquis of Montrose was a Covenanter commander in 1639 and fought with distinction in Aberdeenshire. However, he changed his allegiance because although he was still a supporter of Presbyterianism, he feared that the Covenanters would abolish the monarchy. So he gave his support to the King. He became the King’s Lieutenant and commander of the Royalist army in Scotland. He led successful campaigns against the Covenanters and defeated them in six battles. His troops were mainly made up of Scottish Highlanders and Irish. After victory in Kilsyth, large numbers of Highlanders returned home to bring in the harvest. Montrose moved his men south towards the border in the hopes of enlisting more men to the Royalist cause. He set up camp in Selkirk with 1000 foot soldiers and 500 cavalry on the eve of the Battle of Philiphaugh. The Covenanters had their support mainly in the lowlands. Outdoor services, attended by hundreds, were being held in remote, hidden glens and their leaders and ministers were being hanged, shot or imprisoned by the King’s soldiers. General Sir David Leslie was an experienced soldier and a Covenanter, having signed the Covenant of 1638 set up to prevent the religious “innovations” being imposed by King Charles I.
Leslie and his army crossed the border to Newcastle at the request of the Parliamentarians, another group who had taken a stand against Charles. He returned North, meeting up with forces at Gladsmuir, West of Haddington, East Lothian, before turning South towards Selkirk and Philiphaugh. 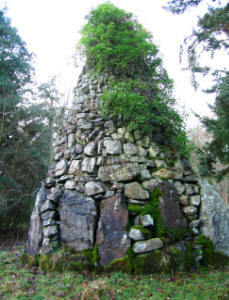 Locals sympathetic to the Covenanters cause, acted as guides and supplied information about the Royalist troops and their movements. Leslie’s force was made up of 4000 cavalry and 2000 men on foot. With the battle lost, Montrose was persuaded by his staff to flee the battlefield. In close formation with some of his remaining mounted troops he fought through the encircling Covenanters, making his way over Minch Moor towards Traquair and Peebles. Montrose never regained his full command, the Royalist cause was finished in Scotland. After a defeat at Carisdale in1650, he was captured, given a sham trial and later executed on Edinburgh High Street. His severed head was displayed on a spike above the Tollbooth. General Sir David Leslie was awarded a substantial amount of money for his service at Philiphaugh. In 1650 Charles II accepted the Covenant and Leslie was given the command of the Scots army against Cromwell at the Battle of Dunbar, which ended in defeat for the Scots. Leslie was later taken prisoner at Worchester fighting for Charles II’s Royalist army. In May 1660, almost two years after Cromwell’s death, Charles II was crowned King of a United Kingdom. Leslie was ennobled as Lord Newark by Charles II. Leslie died in 1682. Prior to his execution Montrose spent an uncomfortable night in the Tollbooth in Edinburgh but even during these final hours he managed to pen a prayer, his Metrical Prayer, which clearly shows his commitment to God and his unshaken belief that God would take him to Him and ‘raise him with the just'. That Montrose could write so eloquently just hours before his pending execution shows not just admirable ability but also astonishing strength of character. In 1810 large quantities of bones and skulls were found on a site near Newark Castle. The field is known as Slain Mens Lea. 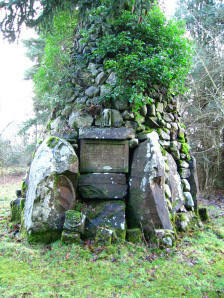 This was thought to be the grave of the executed Royalists from the Battle of Philiphaugh. 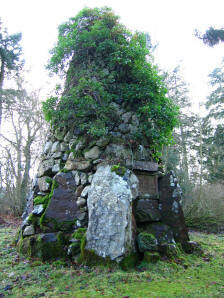 Here are some pictures of the stone monument along the driveway of Philiphaugh.